Brighton Ford : Increasing Oil Costs Have Ford Considering The Use of Shredded U.S. Currency To Make Car Parts! Increasing Oil Costs Have Ford Considering The Use of Shredded U.S. Currency To Make Car Parts! Sustainability has become a high priority for automakers around the globe and Ford is no exception. For years they’ve been finding ways to include recyclable materials in the vehicles they produce and now they plan on taking things a step further by literally shredding money and using it to create car parts. Don’t freak out, its really not as crazy as it sounds. Currently 8,000 to 10,000 pounds of retired paper currency (that’s a lot) are shredded everyday and all those Benjamins are usually just burned or thrown into landfills. Why not actually put them to use instead of creating more waste? “Ford has a long history of developing green technologies because it’s the right thing to do from an environmental perspective,” said John Viera, Ford’s global director of Sustainability and Vehicle Environmental matters. “Now, finding alternative sources for materials is becoming imperative as petroleum prices continue to rise and traditional, less sustainable materials become more expensive. “The potential to reuse some of the country’s paper currency once it has been taken out of circulation is a great example of the kind of research we are doing,” Viera added. Using old paper money isn’t Ford’s first foray into sustainable materials. They save approximately 5 million pounds of petroleum annually through the use of soybean-based cushions in all of their North American vehicles, including the all-new 2013 Fusion. The 2013 Ford Escape is also on the green path with door bolsters partially made of kenaf (a tropical plant in the cotton family), which offsets the use of 300,000 pounds of oil-based resins. 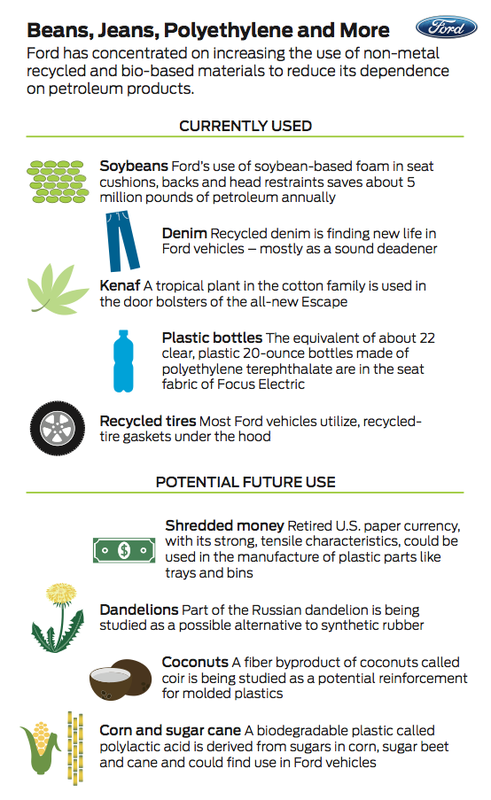 Check out the infographic below for more on what Ford is doing to cut down on its use of petroleum-based products. If you have any questions about the New 2013 Ford Escape, 2013 Ford Fusion or anything else please feel free to Contact Us. We would be happy to field any questions you may have! Brighton Ford is located at 8240 Grand River Ave. just north of I-96 in Brighton. We are a family owned and operated business that strives on customer satisfaction. Brighton Ford proudly serves the Brighton Ford dealership needs, Howell Ford dealership needs, Fowlerville Ford dealership needs, South Lyon Ford dealership needs, Whitmore Lake Ford dealership needs, and Ann Arbor Ford dealership needs. For more information on Brighton Ford visit BrightonFord.com or give us a call at (800)-836-8206.